I know many of you who don’t live near me have been back to school for a while, but ’round these parts, this is back-to-school week. In that spirit, today’s guest, Laura Murray, has a timely story to tell. In THE GINGERBREAD MAN LOOSE IN THE SCHOOL you have combined two bookseller favorites–fractured fairy tale meets back-to-school story. Where and when did you get the idea? The Gingerbread Man Loose in the School was inspired by two ideas colliding. One was when my three-year-old daughter proudly announced one day that she was “one smart cookie.” Her cute comment reminded me of another “smart cookie” I knew – the freshly baked gingerbread man that managed to escape from my kindergarten classroom at the beginning of every school year! Each time this happened, the class hung missing posters and searched the halls, discovering crumbs and dropped candies, as we asked school staff where he might be. But he always found his way back to our classroom on his own! My students absolutely loved this unit and would come back years later asking if the Gingerbread Man had escaped yet. Even though we read many versions of the Gingerbread Man story during the unit, there was not one that mirrored the fun of our school Gingerbread Man chase. So, I decided to learn all that I could about writing for children and try to craft a new version. I started wondering what adventures the Gingerbread Man might have had while he was out and about, and then I began to ask what if…? What if the story was set in a school? What if the story was told by the Gingerbread Man himself? What if he was trying to find the class who made him, instead of running away from them? Those “what if” questions helped me imagine a Gingerbread Man adventure that was sprinkled with fresh, funny twists to set it apart from the traditional tale. This is your first book. What has the experience been like for you? Are you an obsessive Amazon-rank watcher? Do you check every bookstore and turn your book face out? Are you enjoying the ride? I like to say this book was six years in the “baking.” But the first two years were spent learning how to write for children and learning how to write in rhyme. I did that not only through books, but also joining and attending wonderful SCBWI (Society of Children’s Writers and Illustrators) conferences and critique groups. The story went through many, many revisions as I got feedback on how to make it the best it could be. Eventually, I started to research and send my manuscript out to publishers who seemed to be a good fit. After many rejections, it was pulled from the slush pile by an editor at GP Putnam’s Sons and acquired. Needless to say I was giddy with happiness and still am! After many more months, the illustrator, Mike Lowery came on board with a very fresh, endearing, child-friendly style to match the story. What a thrill it was to see the Gingerbread Man come to life through Mike’s illustrations. It is a bit like Christmas or your birthday when you first get sketches of your characters! The promotional aspect has been a different hat to have to wear, and not one that fits on my head very naturally. I just want to “spread the word” about it in a very genuine sort of way if I can, and then let it fly on its own. And I have to say that I didn’t even know that Amazon ranked the books until someone told me. But I have been known to turn copies of it, and other books from authors I know, “face out” in a bookstore display. I also LOVE doing school visits and talking with students! Kids crack me up, and they are just so much fun to be around. I guess that’s still the teacher in me. What children’s book character would you have liked as your real-world best friend? Harry Potter or Hermione Granger – I would have lived in those books if I could have. I love reading them with my kids now, and seeing the magic and wonder again through their eyes. Well, we just finished revisions and illustrations for a sequel-of-sorts coming out summer 2013, called The Gingerbread Man Loose on the Fire Truck. The same dapper and determined smart cookie takes a field trip to the fire station with his class, and oh – the adventures that ensue when he has to escape from the station’s crumb-snatching Dalmatian! And I’m currently working on two more picture books and am in the middle of a middle-grade adventure/mystery as well. A book trailer for The Gingerbread Man Loose in the School just came out as well, with the help of the wonderful children’s writer and motion graphic designer, Carter Higgins. I hope to add it to my website along with lesson plan ideas on how to connect it with curriculum-linked skills. Plus, I just want it to be fun for kids to watch! 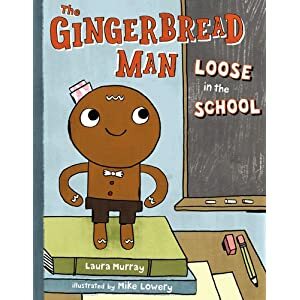 You can catch the Gingerbread Man and find fun activities, a curriculum-linked teacher’s guide, and extension ideas for The Gingerbread Man Loose in the School at Laura’s website. Many thanks for stopping by, Laura! This entry was posted in Uncategorized and tagged back to school, fractured fairy tale, GP Putnam, Laura Murray, Mike Lowery, picture book, The Gingerbread Man Loose in the School, The Gingerbread Man Loose on the Fire Truck. Bookmark the permalink. TGMLITS (aka The Gingerbread Man Loose in the School) is such a fun book! My only regret is that it was not available to my kids when they were starting kindergarten. I like to smell books too. Wouldn’t it be AWESOME if they could scent TGMLITS to smell like gingerbread? ?